Hello Katie Girl: The Bag's the Thing! Over the years, my collection of bags and also shoes that look like other things has grown and grown. I used to think that I was a little weird in coveting this particular style of accessory, but now I am starting to see more and more designers produce quirky bags that play homage to everything from food to cartoon characters to mundane objects from everyday life, such as the Moschino stop sign bag below that cleverly replaces "stop" with "shop". Speaking of shopping, I might just be in the market for a few more bags to add to my growing collection. (Maybe Santa will leave one under the tree for me if I'm good...hint, hint!) 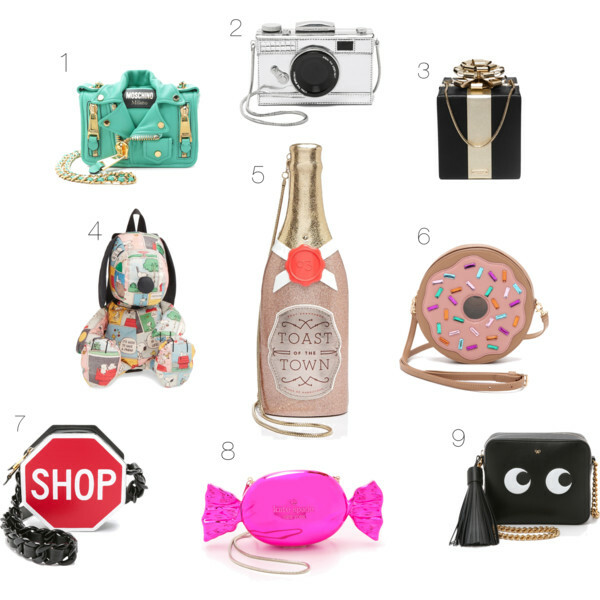 If you are also on the lookout for a playful bag or if you are just looking for a fun gift for someone who is a little bit on the quirkier side when it comes to fashion, the above are my picks for the best of the best when it comes to charming bags that look like other things. The Kate Spade ones are especially perfect for the holiday season with festive champagne bottles and presents. What a great roundup of fun bags! I love that champagne bag and the googly eyes is so cute! I really like your picks.#3 and #6 are my favorites. Coool bagg! i love 2 and 3! These bags are so cute! I don't have any fun bags and think I need at least like that great donut one. Thank you for joining TBT Fashion link up and hope to see you next week. Have a great weekend! These are so fun! I couldn't tell that they were bags at first! What fun shapes! I love fun bags and these are a great collection. I love some of your bags especially that artist palette one. You have the most fun and most whimsical collection of bags for sure. I need some more fun, whimsy graphic bags. All your choices are great. I love the three on top and the pink candy-wrapped one the most.